Silt curtains or turbidity barriers are normally made of a geotextile membrane that floats and is anchored to the bottom by weights. These products are designed to prevent sediment from entering clean bodies of water or watercourses. Turbidity barriers are considered best management practices (BMP), and sometimes they can be considered as supplemental sediment control methods. They are normally installed when working within watercourses or in construction sites that will impact neighboring water bodies. These barriers can be used in tidal or non-tidal watercourses. Install the barrier as close as possible to where the construction activities are happening. If you can identify the area at which the sediment is entering the water, install the barrier as close as possible to that area. The barrier shall be kept in place until all construction has been completed. The silt curtain shall be anchored to the shoreline to prevent sediment from bypassing the barrier. Steel posts must be installed to secure the barrier in place. Space them 10 feet center to center. When the barrier is higher than eight feet, the spacing shall be closer. 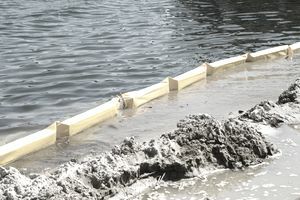 If unable to drive posts, use float devices attached to the silt curtain. Flotation devices shall support the weight of the barrier and must be able to maintain a freeboard of at least three inches above the water level. When installing the barrier, take into consideration seasonal fluctuations and variations of the water level to maintain the curtain in place. Do not install the barrier higher that the top of the bank. Ballast shall consist of a chain installed at the bottom of the screen. Special consideration and regulations apply when installing turbidity barriers in navigable waters. Turbidity barriers shall be installed parallel to the direction of flow and shall not be installed across channels. It is recommended to inspect silt curtains on a daily basis or every time runoff water is present. When sizing the length of the floating curtain, allow an additional 10 percent to 20 percent variance in the straight-line measurements. Barriers should be a bright color, yellow or “international” orange, making them visible to boaters. If possible, install two parallel curtains, separated at regular intervals by 10-foot-long wooden boards to increase the effectiveness of the curtain. When removing the barrier, be sure to do so gently and carefully to prevent sediment from entering into the water body once the soil is disturbed. Turbidity barriers can be combined with traditional methods, such as concrete traffic barriers, coffer dams, pumping, or sheet piling. Do not remove sediment unless instructed to do so by the AHJ. If you are ordered to do so, re-suspension of sediment might be happen. Silt curtains are most effective when using with traditional erosion control methods. Turbidity barriers should not be used to reduce the conveyance capacity of the channel. Barriers can be installed on the banks of a waterway only if the water levels could get to that height. A turbidity barrier can be purchased at an affordable price, considering the fines you could receive by violating the EPA's Clean Water Act. The cost of the material will vary widely depending on the type of barrier being procured. There are different types of barriers that will be needed and will depend on the size, application, and amount of soil being discharged into the water body. At an average cost, turbidity barriers can be obtained at about $550 for a 5' x 50' barrier. Higher prices can be obtained in more specialized curtains and materials used to manufacture it. Installation prices will also range based on factors affecting installation. A good number that you can use to estimate the procurement and installation is about $8.25 per linear foot.